Last week I invited my father and my brother over for dinner. 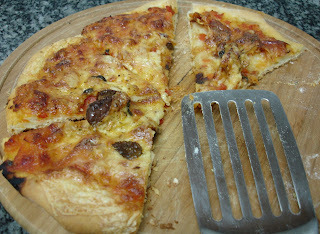 The menu was... homemade pizza! I got the recipe from Dough: Simple Contemporary Breads - which is one of my favorite cookbooks. The photos are beautiful and I felt like running to the kitchen to prepare ALL the recipes the minute I started flipping through the book. There's a DVD included, which shows Richard Bertinet's way of preparing dough. I liked it a lot, too. 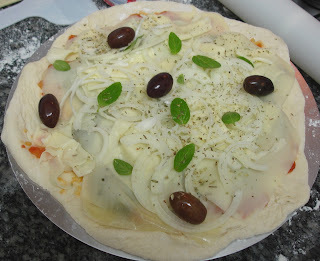 I got 3 big pizzas with the dough - each one around 30cm large. I had already made this recipe before, but I used all purpose flour and had to add more flour to get it right (something against the author's technique). But this time I used a special bread flour that was released here in Brazil and it worked perfectly! Place the flour in a large bowl. 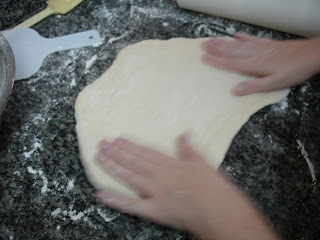 Add the yeast and rub it with the flour using your fingertips. Add the salt, water and olive oil and mix until you have a mixture that resembles porridge. Stretch the front of the dough towards you, then lift it back over itself to form an arc - this will trap the air - still stretching it forwards and sideways and tucking it in around the edges. Repeat this sequence until the dough is not sticky anymore. Place the dough in a lightly floured bowl, cover and let it rest for 70 minutes or overnight in the freezer, for better crust and taste - mine rose for 3 hours. Turn the dough onto a lightly floured surface, shape into a ball and let it rest for 10 minutes. Divide the ball into three even parts. Continue to work on an evenly floured surface so your dough won't stick to it. 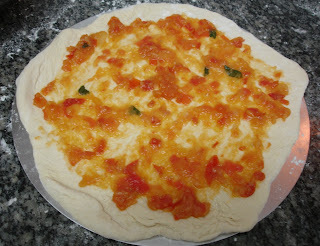 Slide the pizza to a pre-heated baking tray or stone and bake for 20 minutes or until the dough is cooked and golden. I don't have a baking stone and placed the pizza on cool baking trays, so it took my oven 40 minutes to bake them. your pizza is the one I'd die for! Perfect golden-brown crust with a bit of char (oh I love that! ), plus some puff here and there... fantastic! Your book so good comes with dvd, sometimes after reading a thousand words on directions I still can't get the idea. I'm very curious about your author's kneading method... I've learnt another one which is actually slapping the dough on table on tv, really fun, although I can actually knead the dough in the tradtional way with success. These look wonderful! Did you notice a difference in the crispness or tenderness of the crust when using the new flour? I love this post! We have pizza on the menu for Friday... I'm sure it won't be nearly as yummy as yours looks. 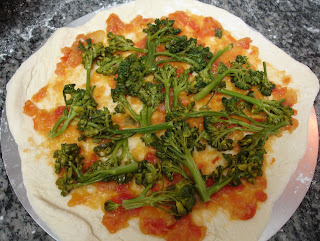 I never thought of putting broccoli on a pizza... very creative of you! Dear Gattina, you're much too kind! What lovely things to write, my friend! You're so generous and kind! That's why I'm a big fan of yours! I'm a very visual person, too, and I always look for instructions that come with pictures - sometimes, I'm able to get the whole idea with them! Good thing you mentioned this. These pizzas were crispier, indeed, tks for asking such important info! Here in Brazil some places use all sorts of things as pizza toppings. More conservative people get mad because they say the only legitimate pizza is margherita (mozzarella, basil leaves and tomato sauce). I'm not that strict and like other things, too, such as broccoli. I think it's also a good way to make kids have some importante vegetables. I'm sitting here in front of the computer wanting a slice of pizza. It looks very delicious. Well done! 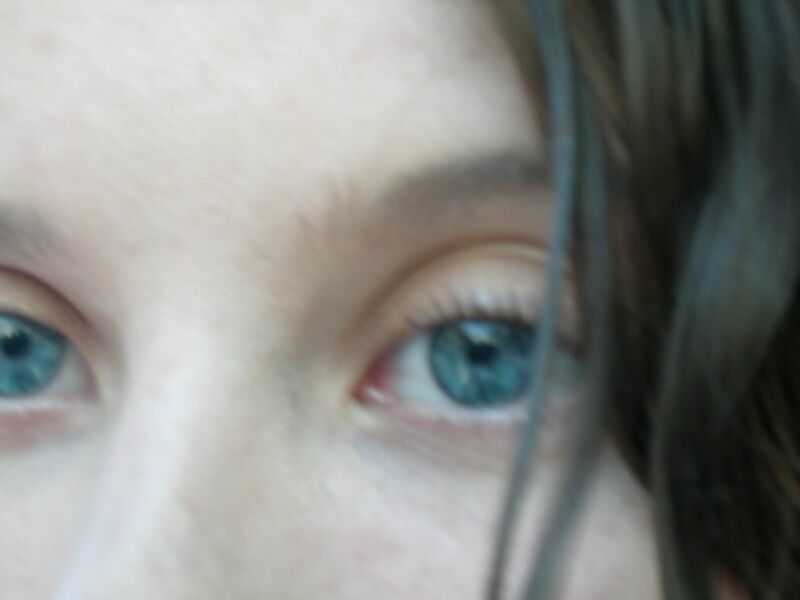 Hi, Rachel, thank you for visiting my blog! I like your recipes a lot, too! Tatter, his book is amazing! I can't wait to try the other recipes. I just check your photos - they're amazing! You are a very talented cook! Veron, thank you! I love pizza, too, and this has become a favorite in my house.